I don’t know how I got talked into this, as mud is definitely not my thing, but I found myself in Pulaski, Tennessee, shivering in 50 degree weather while covered in it. The Warrior Dash is a 5kish (ours was 3.6 miles) obstacle course fun run (meaning it is not timed). As far as obstacle mud runs go, from what I understand, it is one of the easier ones, meaning you can probably do most of it without specifically training for it, even if you aren’t in shape, and you can just walk around obstacles you don’t want to do. (I heard in the Spartan Race, they make you do burpees if you pass an obstacle!) Anyway, most of our group stayed together to help each other through things, so we took our sweet time getting through the event. Our wave was at 11:45am. This was a good time so we didn’t have to get up at the crack of dawn to make the nearly two hour trip down to Pulaski from Nashville. Packet pickup was easy. They gave us our bib, shirt, and warrior hat. After dumping all but our bibs back in our cars, we headed toward the start line. Our wave started promptly at 11:45. And we were greeted by the most gigantic hill I have ever seen. While we all started off running, one by one, we all slowed to a walk. (Except Jonathan, who decided to power up the mountain, but then had to wait for us. I think he regretted that a little the next day when his legs were sore for his soccer game!) A few more hills later, we were at our first obstacle: the mud mounds. You climb up a small hill of mud, then down a hill of mud into a mud pit and then somehow have to climb out of the mud pit. I must have picked the non-rocky side because there was nothing to get a hold of on the way out. Jonathan came back to check on me and had to help me out, since I just kept sliding back in. Yum! We ran to catch up with the rest of the group, then it was on to obstacle two. Now, I had checked out the list of obstacles that were going to be there ahead of time (they change for every location), and this one was not on it. According to the website, it is called Deadman’s Drop. You climb up a vertical wall, then you have to go over an overhang to climb down the other side. Overhangs in rock climbing are my nemesis (I always fall), and I had nothing keeping me from falling to the ground here. I got to the top, and could not figure out a way to get my short legs over that overhang without falling to my death. So I climbed down and went around it. We had one girl in our group who is a few inches shorter than me. She luckily had someone help her over that thing. I don’t remember the order of the next few obstacles. Most things either had you climbing over a wall or crawling on the ground. We went over the Diesel Dome, which looked kind of like a wooden domed jungle gym. It didn’t seem so bad till you got to the top and all the wood planks to get across to the other side were forever apart. There was Storming Normandy, where we had to crawl under real barbed wire, and the Trenches where we had to crawl through tunnels of mud. (My knees were being tortured.) Two x Fall wasn’t bad; it was just a balance obstacle with a couple of shortish walls to climb over. On one of the obstacles, I had to get a random stranger to boost me up over some walls because my short legs just wouldn’t reach! Some things were definitely tall-people friendly. Around the middle of the race, we reached Alcatraz, which involved wading out in some waist-deep water to a floating thing covered with a cargo net. You walk across it, then jump back in the water (then practically neck-deep on me) to get to the other side of the shore. Thankfully, it seemed like they stacked the harder obstacles at the front of the race because most of the last ones were pretty easy. There was the Warrior Peak, where you use rope to climb up a slanted wall and back down the other side. 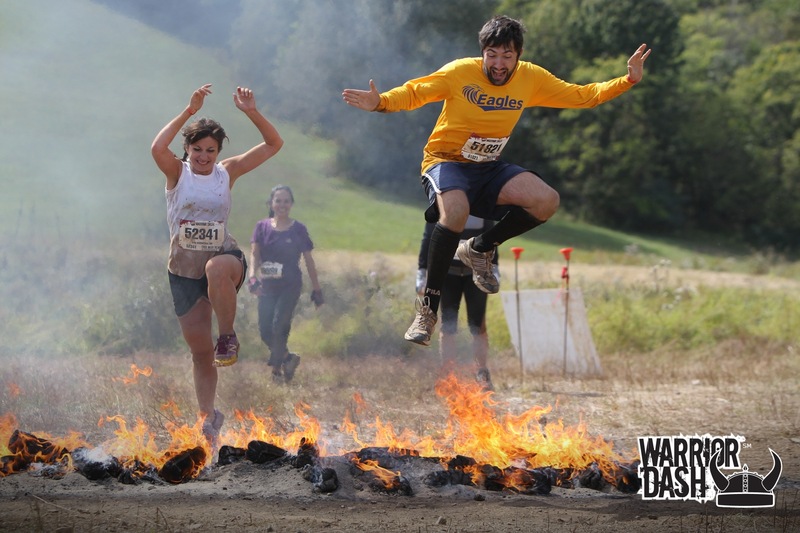 Then the Warrior Roast, where you jump over the fire. The second to last obstacle was Goliath. You climbed up a net, then over a wall. Then there was a rope net horizontally to crawl across. I just rolled across it; must less chance of falling through to the hard ground below. After that, you got to slide down into a pit of water. I didn’t really expect the water to be deep, but I went underwater! Brr! We were all nice and clean from the water at that point, when we came up on the last obstacle: Muddy Mayhem. 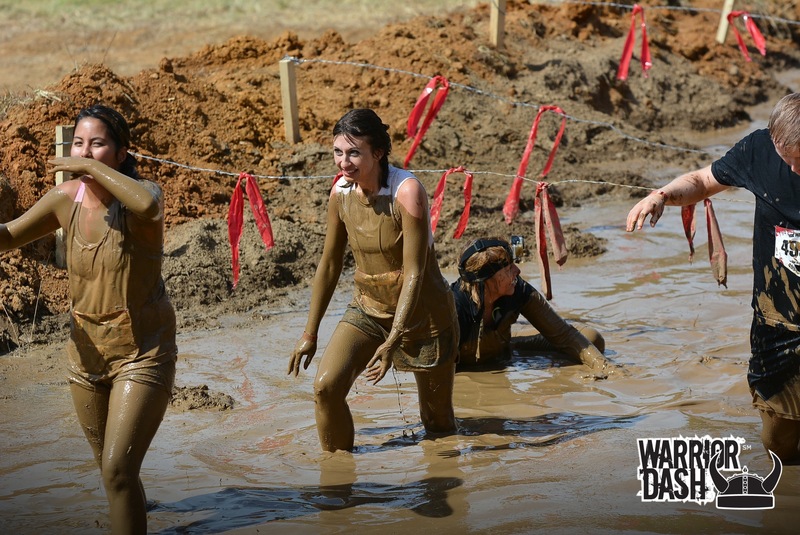 It’s a mud pit with barbed wire across it, so you have to duck down underneath it, virtually covering your entire body in mud. Also, I don’t want to know what was in that pit. 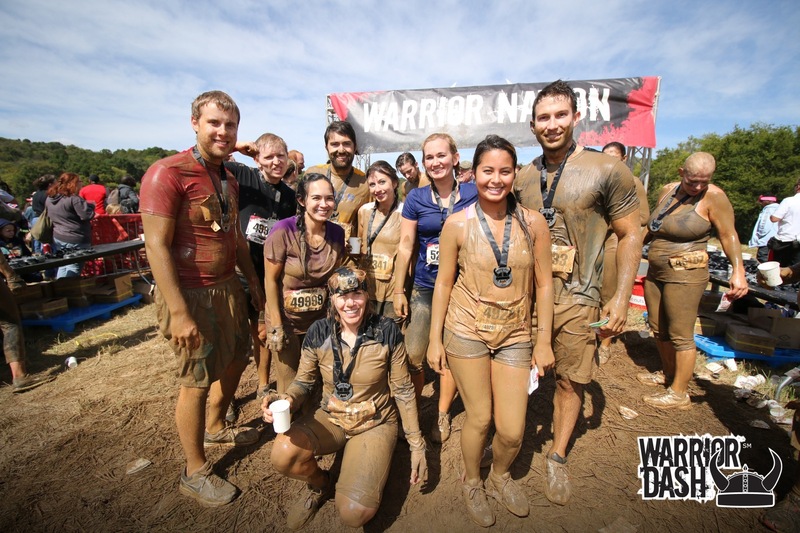 We all made it out of the mud, then ran to the finish line. I was expecting a nice finish line pic, but they were handing out medals BEFORE the actual finish, so I had to stop and wait for one before I could cross. I think we ended up taking about an hour and a half total. Overall, it was pretty fun. It would have been more fun had it not been the coldest day in the past six months, but you warmed up pretty well while running. It was just bad at the end when you were done running and covered in mud. We didn’t have to wait much for most of the obstacles, and I enjoyed just jogging/walking along with everyone and not worrying about time. Nothing was really hard physically (except maybe that initial hill! 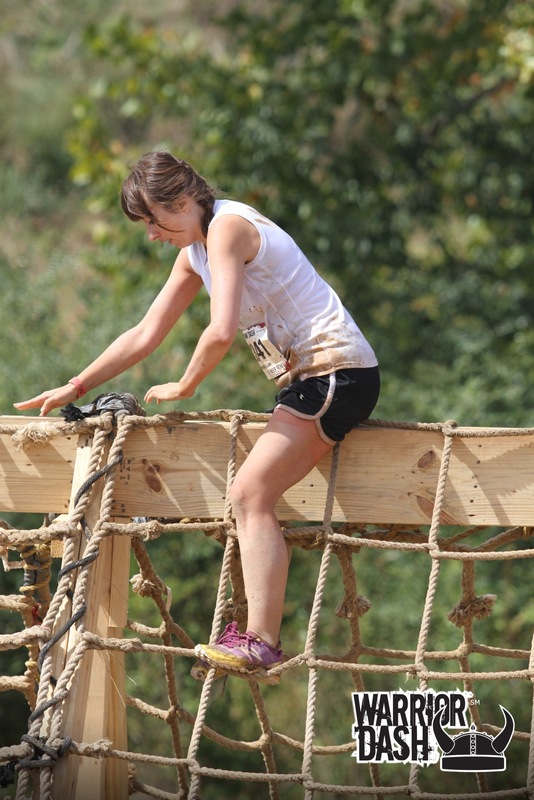 ), just several obstacles with a “fear factor”: falling, contracting tetanus from barbed wire, etc. I only skipped the one obstacle, due to my shorty legs, though I think I could have made it over that one had someone been on the other side to help me over or if I weren’t so concerned about hurting myself right before I’m supposed to start half training. There were some fun downhill sections through the woods where you couldn’t stop running (GET OUT OF THE WAY, people slowly climbing down. I CANNOT STOP AND I WILL HIT YOU), even if it was mildly uncomfortable due to the inevitable rocks in your shoes from wading through water and mud. I super appreciate that the photos are free, although it’s a little weird that all the photographers were concentrated at the end. I might have liked one from the balance obstacle or Alcatraz! Would I do it again? Probably not (especially if I don’t have someone else footing the bill for it…it’s pretty pricey! ), but, as I said, I’m not a huge fan of mud. It was definitely a good experience, though! 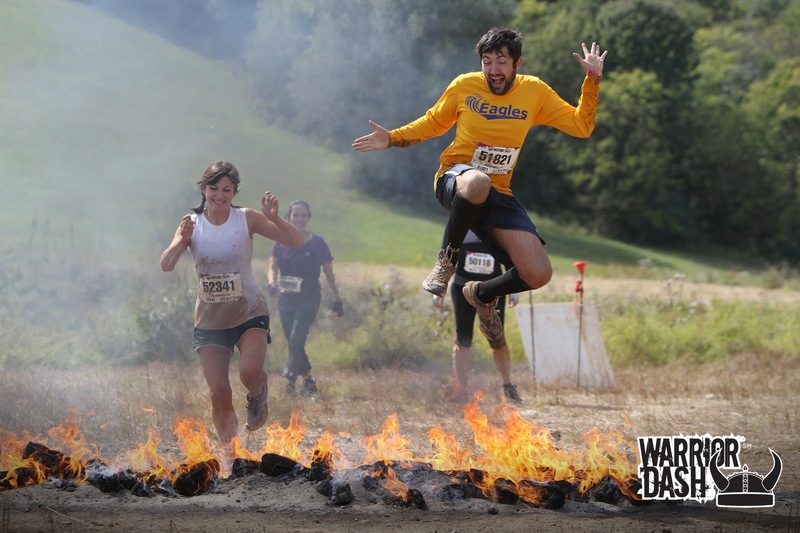 This entry was posted in Race and tagged fun run, warrior dash. Bookmark the permalink.